Recent attacks in Manchester, London and around the world have heightened our awareness of the possibility of a major incident being declared at any time of day or night. As emergency physicians (and all specialities really) we need to think hard about how we prepare and organise ourselves for how we might respond. This blog builds on the experience in Manchester and London regarding alerting procedures for major incidents. In Manchester the bomb at the Ariana Grande concert exploded at about 22:35. At that time we typically have 2-3 consultants on duty between the adult and children’s emergency departments. That’s not enough to cover a major incident response and so we need to call people in, but how? The traditional method is the telephone cascade. Someone (switchboard or the onsite consultant) gets an up to date list of colleagues and then starts phoning or paging them in from the top of the list until they have enough people to come in. This system is based on old style phones or pagers1 and really does not reflect how we communicate in the modern world. The traditional method is slow, phone numbers may be out of date and it’s difficult to know who has reponded and how. Unsurprisingly then new communication methods such as WhatsApp have been mooted as the solution (Ed – you could also use other systems like Slack, Yammer, or many others, but we have most experience with whatsapp). Despite some concerns about confidentiality it’s abundently clear that many, if not most, clinical groups are now using some form of closed messaging system to keep in touch. WhatsApp is secure, easy to use and easy to modify and it’s no surprise that it was used in the UK during the recent terrorist attacks. You can read more about how it worked in London on Helgi’s BMJ blog here. There is more detail on his personal blog here2. So here’s a few thoughts on how to set yourself up so that it works well. Set some ground rules about what goes on this group. 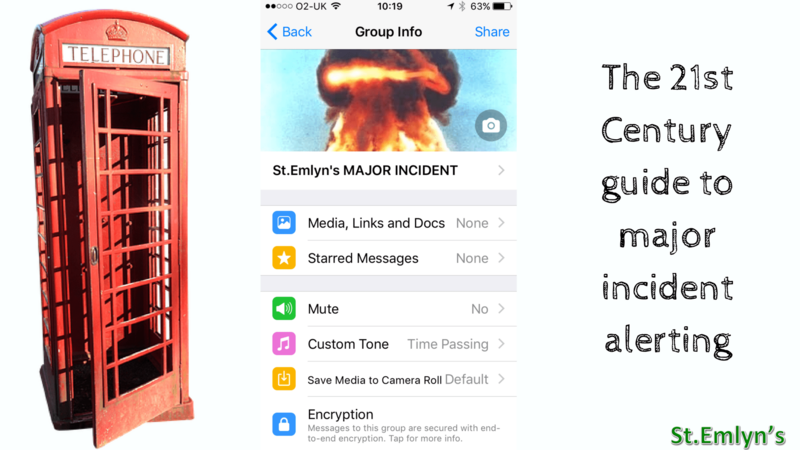 Basically keep it for major incidents or other time critical, highly important messages. By all means have a different group for general banter. 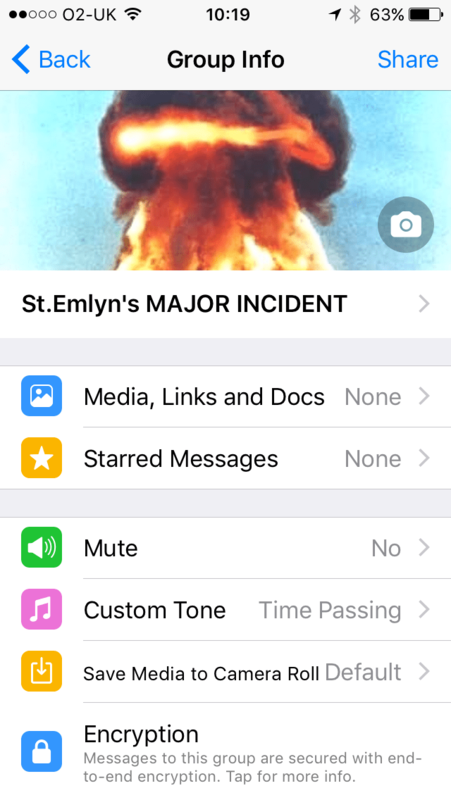 What about actually using whatsapp during an incident? Well it’s not perfect as we found in Manchester. Some people quite rightly have their phones turned off at night, or are away on holiday, or have family commitments which mean they cannot repond. You can never get away from that, but it’s still better than most traditional systems. We also need to be mindful that the person who is actually in the department will not want to be spending all their time replying to whatsapp messages as they will be busy doing other stuff. So here are a few tips that might help. EMERGENCY SERVICES REQUIRED what response you require of colleagues and the department – how many need to come in now (e.g. we have two consultants, 3 middle grades and 5 juniors present: We require 6 additional consultants now, and double our junior numbers if possible). Once declared someone else in the group should volunteer to collate and respond to other colleagues. Essential tasks are. Identify how many need to come in now. Identify who needs to not come in in order to manage the workload over the next 24-48 hours. Consider that all communications made via whatsapp would likely be releasable at a later date as part of an investigation into the incident. In part this is excellent as it gives a timed log of events and what happened with an electronic time stamp. Just be mindful that you stay professional and sensible at all times. And that’s it really. It should not be complex and it should not be difficult to do. It’s not perfect as it still requires you to have your phone on, whatsapp alerts on and for you to be available. It’s clearly a better system than call-in lists by phone and recent experiences in the UK suggest that it was effective4. You may be concerned that whatsapp might be compromised and your communications eavesdropped upon. In reality that’s extremely unlikely as the security on whatsapp is very secure. Technically I think some parties may suggest that you cannot do this for antiquated IT rules, but these are interesting and worrying times and we need to be prepared. The usual social media rules apply – don’t be an idiot5. In the last 24 hours the threat level in the UK has been raised to critical and all NHS organisations have been asked to ensure that they are prepared. My final thought is therefore to set up your whatsapp groups now (unless you have something better already) as making it up on the night really does not work. Old technology: NHS uses 10% of world’s pagers at annual cost of £6.6m. the Guardian. https://www.theguardian.com/society/2017/sep/09/old-technology-nhs-uses-10-of-worlds-pagers-at-annual-cost-of-66m. Published 2017. Accessed September 16, 2017. WhatsApp doc. traumagasdoc. https://traumagasdoc.wordpress.com/2017/07/23/whatsapp-doc/. Published 2017. Accessed September 16, 2017. Major Incident Medical Management and Support: Hospital. ALSG. http://www.alsg.org/uk/HMIMMS. Published 2017. Accessed September 16, 2017. Should doctors use WhatsApp to bypass archaic NHS tech? . The Guardian. https://www.theguardian.com/healthcare-network/views-from-the-nhs-frontline/2017/jun/05/should-doctors-use-whatsapp-to-bypass-archaic-nhs-tech. Published 2017. Accessed September 16, 2017. Doctors’ use of Facebook, Twitter, and WhatsApp is the focus of 28 GMC investigations. BMJ. http://www.bmj.com/content/358/bmj.j4099. Published 2017. Accessed September 16, 2017. Great point Luke. Past major incidents have really struggled to keep a log of events. This may we’ll help. Also worth remembering that smart phones have voice recorders that you can use to keep contemporaneous notes. Again these are time and date stamped electronically. Interesting post. To add to A of METHANE I find teaching “Access & Egress” engages the thought process for both pre-hospital and in-hospital teams about flow of casualties. Prehospital we need transport in and out – clogging the one way street with emergency vehicles can cause many problems when casualties need transport to hospital. Additionally it highlights the need to decide which centres are going to be recieving casualties on a gross scale. In hospital I think it’s useful to think about egress in terms of early movement of non-critical patients from our emergency departments, theatres and wards. Where will critically injuries patients ‘egress’ from ED to? Don’t know the technical details but as far as I know parts oft the mobile nets are turned off during terrorist attacks. Does this matter for whatsapp?